Ohio Gov. 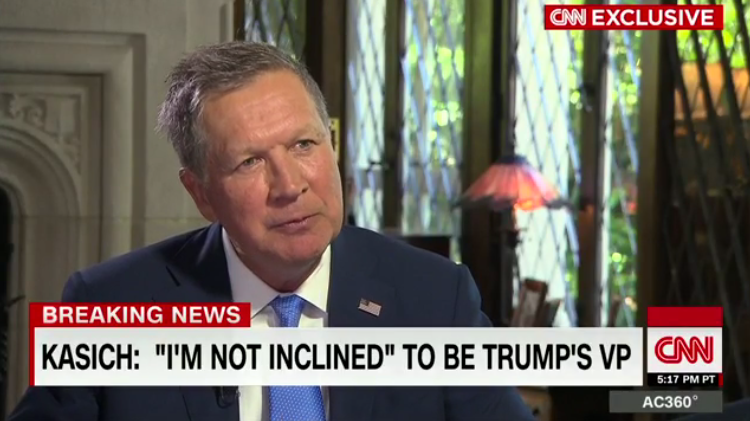 John Kasich broke his silence Monday since dropping out of the presidential race early May. In an interview with CNN's Anderson Cooper that aired Monday night, Kasich said he's “undecided” on whether to endorse his former rival Donald Trump. "At the end of the day, endorsing is gonna mean a lot," he said. "And frankly, my wife and my daughters have watched this. And if I were to turn around today and endorse him, they'd be like, 'Why, Dad?' And that matters to me." "We'll see what he does," Kasich went on. "He has a chance to move to the positive side and unify this country." On whether he would consider being Trump’s vice presidential pick, Kasich said he’s “not inclined” to run with him. “I’m not inclined to do that,” he insisted. "And I'm really actually excited about getting back here with my team for the state of Ohio. And I gave it my best."